Chronic heel pain from plantar fasciitis is often worse in the morning. Now you can get the same professional night-time relief prescribed by podiatrists and orthopaedists with the Comfort Ease Night Splint. It holds the foot and toes in a flexed position throughout the night, stretching the plantar fascia and the Achilles tendon to relieve the pain of plantar fasciitis. 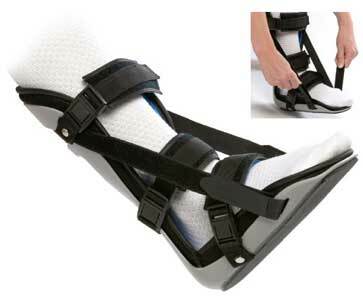 Several scientific studies of night time splints report complete relief after 4-12 weeks of wear.